However, it’s important to remember that you can’t jump into this routine without jumping over some relatively painful hurdles. At first, you’ll feel tired, but once you can get past the difficult step, you should be able to build a quality routine that helps you be productive in the wee hours of the morning. 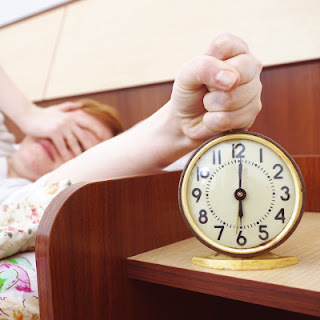 If you don’t have kids or a pet to let you know that it is time to wake up, you probably use an alarm clock to wake yourself up in the morning. You can make it easier to get out of bed by using a song that makes you want to get pumped up and ready to go. A good heavy metal song will work, or you could just go with a funky-fresh track that makes you want to get up and dance. If you’re using your smartphone as an alarm clock, chances are that you keep it right by your bedside and charge it overnight. This makes it awfully tempting to just hit the snooze button and go back to sleep. If you keep your phone on the other side of the room, you’ll be forced to get out of your comfy bed and welcome the morning with open, if somewhat reluctant, arms. When you sleep, your body goes without water for several hours - this is why you might feel dehydrated in the morning. Jumpstart your system by downing a tall glass of water, conveniently left by your bedside overnight. Just make sure that your cat doesn’t knock it over first. Even with a glass of water rejuvenating your system, you’ll need to get your body moving if you want to accomplish anything important. Get your blood pumping with an invigorating jog around the block, or go for a walk down the street. You’ll find that you can focus better on what’s important. Now that you’re ready to get something done, get to it… in a little while. One of the best ways to get going in the morning is to start with something that’s not necessarily important, but rather, something that you particularly care about. Maybe you could take your dog for a walk around the block and enjoy the scenery; you could knock out two birds with one stone, so to speak. Then, when you get back, try to get something important done. Do you eat breakfast every day? If not, your mood and your health could be at risk. In order to feel your best and get the most work done throughout the day, you need to eat breakfast in the morning, be it a simple bowl of cereal, or a lavish meal of steak and eggs. Ideally, you want something that’s quick and easy but still packed with protein and other important nutrients. What are some of your favorite ways to get the day started the right way? Let us know in the comments, and subscribe to our blog for more great tips and tricks.